How Old is Your Government? I thought the comparison with age of population was a smart addition. 4 Responses to How Old is Your Government? 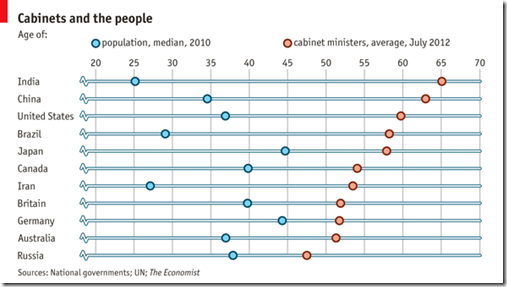 Population average is a median and ministers average is simply labelled as “average”, I guess they calculated a mean. Shouldn’t both averages be the same and preferably both medians? you’d better include Italy in the list… well, the median age is high, but the premier’s too, and since Nineties…. This graph should be reordered by the relative age gap between population and ministers. Please redo.